Thum! Kaun Aata Hai? : Maitri SR-SAM as Akash Mk-2? 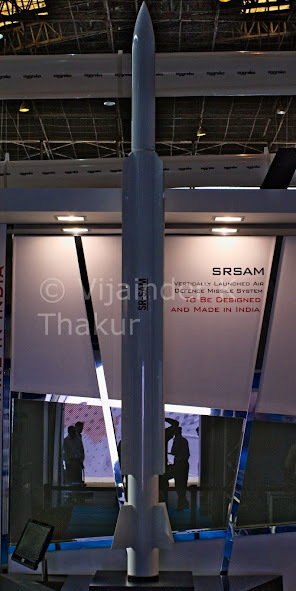 Proposed DRDO-MBDA SR-SAM at Aero India 2015. Call it Maitri, or call it Akash Mk-2! DRDO, following its tortured success with the Akash missile, a 1970s vintage SA-6 analog with modern day guidance and electronics, is now looking into a longer range (60-km) missile with active seeker, vertical launch and anti-ship missile capability. It all started when the 2010 year end GOI press release referred to a Mark-2 version of the Akash. In an interview in August 2014, former DRDO Chief Avinash Chander said, "We are examining various options for Akash Mk-2 so that it can operate over a larger profile. One of the options is putting a seeker on board. Of course its not simply a matter of adding a seeker since it changes the entire dynamics of the missile. Nevertheless we are looking at multiple options and are certainly working on a Mark 2 version of the Akash." Defenseworld.net in a report on January 22, 2015 quoted a source as saying that the DRDO has decided to increase the range of the Aakash surface to air missile (SAM) and provide it with a ‘seeker’ in its warhead to achieve better targeting efficiency. Most anti-ship missiles use active radar homing for terminal guidance so the use of an active seeker on Akash Mk-2 is logical. Let us get some things clear, before moving forward. Its name notwithstanding, Akash Mk-2 will not be derivative of the Akash missile; it will be a new missile built from scratch using substantially different technologies. An active seeker makes a missile more accurate and less susceptible to countermeasures. It also gives the missile system some fire and forget capability, freeing it to engage other threats following terminal lock-on by the last launched missile. The challenge in developing an active seeker is to minimize its size and weight while maximizing tracking range. India doesn't have a Akash Mk-2 worthy active seeker yet. DRDO is still struggling to replicate the Russian active seeker fitted on its Astra air-to-air missile under a partial TOT arrangement. Private sector company Alpha Technology show cased an RF seeker that it has developed for Brahmos at Aero India 2015. However, the seeker is yet to be accepted as a substitute for the Russian developed Brahmos seeker. We are trying hard, but the truth is we are not there yet, and active seeker development poses risks for the Akash Mk-2 project. Vertical launch of surface-to-air missiles is also a new area for DRDO which has earlier demonstrated vertical launch with the Brahmos and some of its strategic missile. A vertically launched surface-to-air missile must quickly flip over in the direction of the threat and then be command guided towards the target over a data link. Another big difference between Akash and Akash Mk-2 would be the dropping of Akash-1's ramjet sustainer in favor of pulsed rocket motor. A pulsed rocket motor has multiple propellant segments, with a barrier that stops ignition separating any two segments. When one segment burns out the missile coasts till another segment is ignited. During end game, a freshly ignited rocket motor segment would make Akash Mk-2 much more lethal than the ramjet of Akash. Pulsed rocket motor technology is something that the DRDO has imbibed working with Israel's IAI in the LR-SAM/MR-SAM project. So no problems there. Faced with cancellation of the Maitri SR-SAM joint project, after an underfunded IAF decided to make do with the Akash missiles, France's MBDA is plugging the Maitri joint collaboration as the Akash-2 project! The MBDA pitch might look opportunistic and self-serving at the outset, but if you listen to what MBDA officials have to say, you could well change your mind. MBDA officials categorically confirmed to IDP Sentinel during Aero India 2015 that they will transfer complete seeker technology to DRDO. There was no question of a partial TOT as was the case with Russia and the Astra missile. MBDA believes that the risks involved in a project to develop a missile from scratch, as DRDO intends to do with Akash 2, are substantial with long and uncertain development time. Seeker and Vertical Launch are risk areas. India would be much better off getting the technology from MBDA so that timelines are not stretched to an extent where the usefulness of the product comes under a cloud. I am sure there are other facets of the Akash Mk-2 project that I am not aware of, but going exclusively by the information available in public domain, it's hard to understand why DRDO must take risks when it doesn't have to.